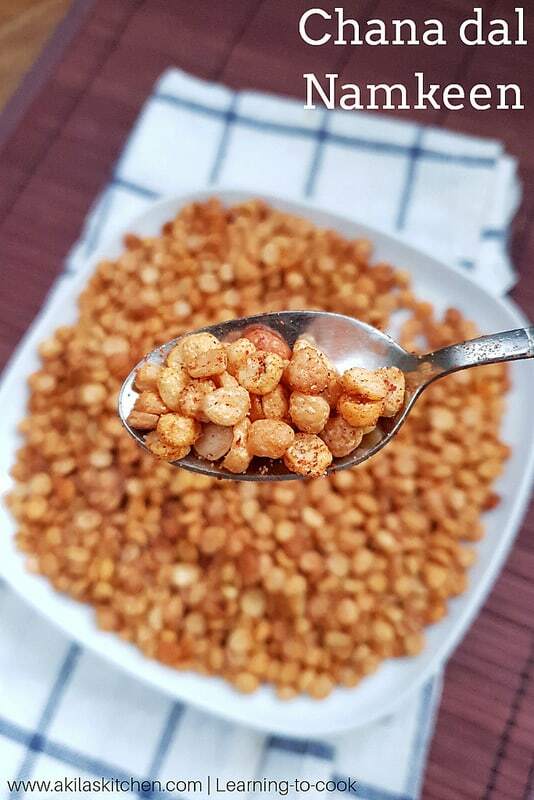 Kadalai paruppu fry | chana dal Namkeen Haldirams style is a deep fried snack prepared with bengal gram and mixed with Indian spices to make it more tastier. 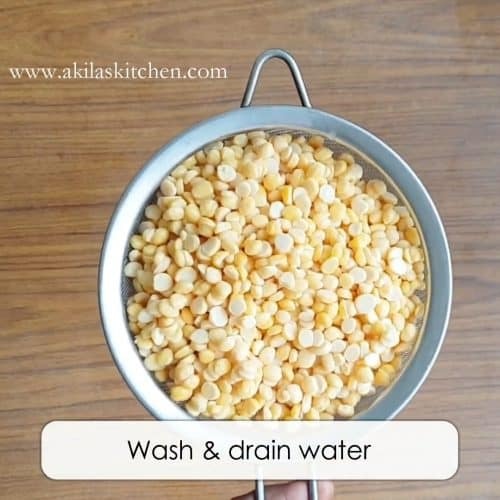 Kadalai paruppu fry | chana dal Namkeen Haldirams style recipe with step by step instructions for your easy understanding and learning. 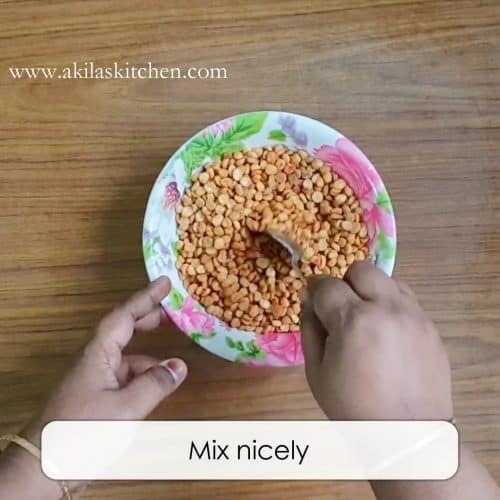 There are many variations in making this Kadalai paruppu fry | chana dal Namkeen Haldirams style and today we see how to prepare this yummy and spicy snack in North Indian Style. In south India this is mostly prepared in the same way, but the spices differ and we call them as Nei Kadalai or Kadalai paruppu varuval. Soon we will see the preparation of Nei kdalai also. Also while preparing this snack, it can either be fried directly in oil or using a filter or colander and fry in batches. Here I have followed the second option as it is easy to avoid the over frying of the kadalai. 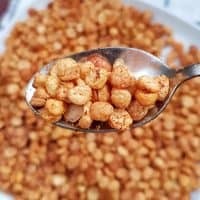 If you like the snack recipes, then do check my other fried snacks like below crispy Moong dal fry, sweet maida biscuits, baby corn golden fry, cabbage pakoda, savory diamond cuts, roasted phool makhana, ring murukku. 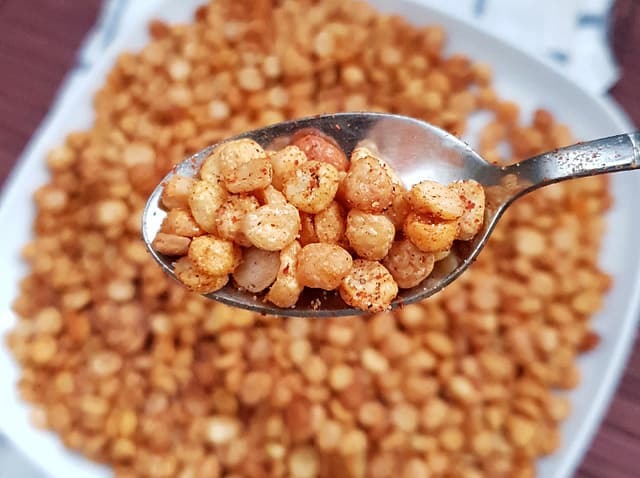 Kadalai paruppu fry | chana dal Namkeen Haldirams style is a deep fried snack prepared with bengal gram and mixed with Indian spices to make it more tastier. 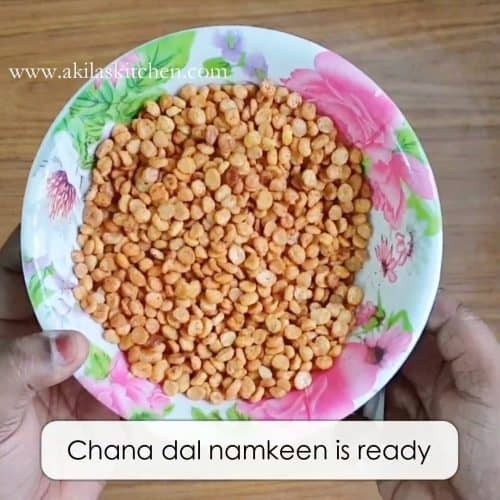 There are many variations in making this Kadalai paruppu fry | chana dal Namkeen Haldirams style and today we see how to prepare this yummy and spicy snack in North Indian Style. while preparing this snack, it can either be fried directly in oil or using a filter or colander and fry in batches. 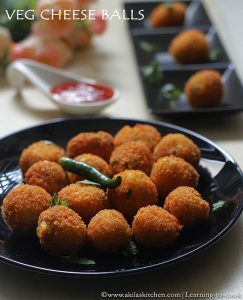 Here I have followed the second option as it is easy to avoid the over frying of the kadalai. 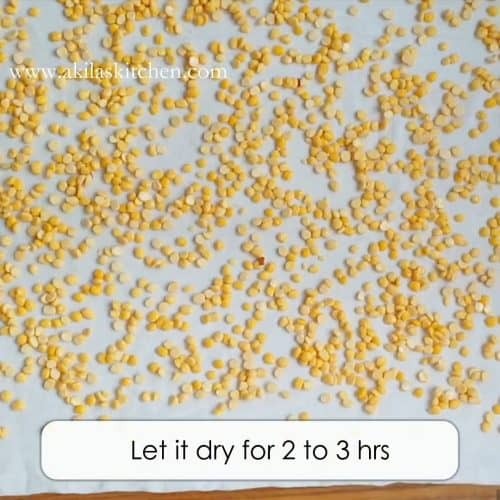 Soak the chana dal for 8 hours or whole night. It need to be soaked atleast for 5 hours else, the chana dal fry wont come crispily. Filter out the water, and dry out completely in a white cloth for atleast 2 to 3 hrs. Do not keep under sun. But can be kept under shadow. Once it is dried out completely, collect and keep it ready. to fry the chana dal, add enough oil for frying. 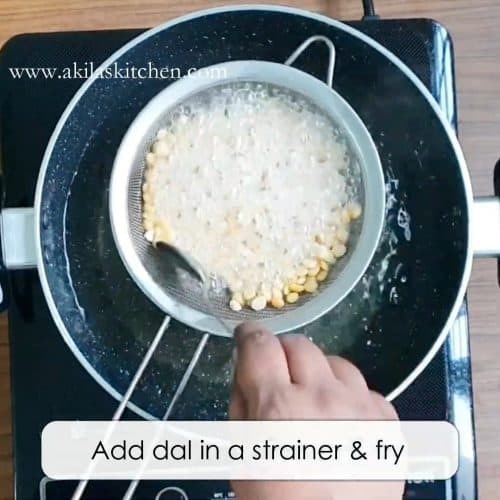 Add a single dal and check whether oil is hot enough for frying. 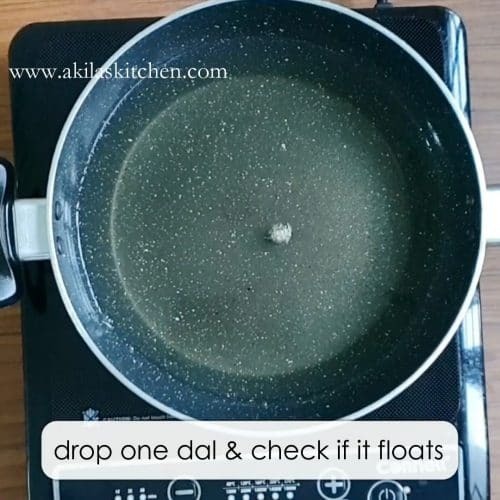 Once the dal starts floating immediately, then you can add in the other dal too. 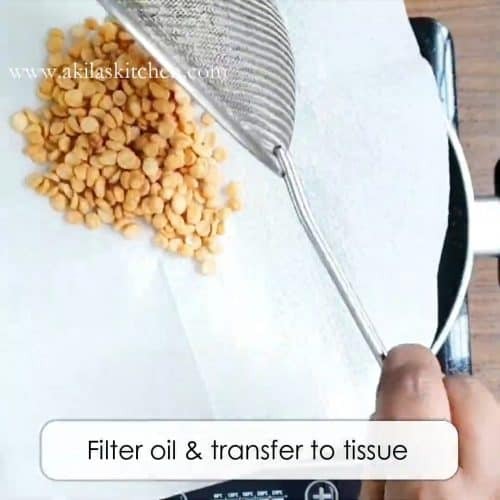 Instead of adding the dal directly to the hot oil, take a handful of dal and fry using a filter as shown below. If all the dal are added, some get burnt and some may be undercooked and you wont get the perfect crispiness of all the dals. So frying the dal, using a filter gives an even frying and gives a perfect crispiness to all the dal. Also fry them in medium flame only. Once the dal comes to light brown color, then filter oil and remove it. Continue with other batches of dal. 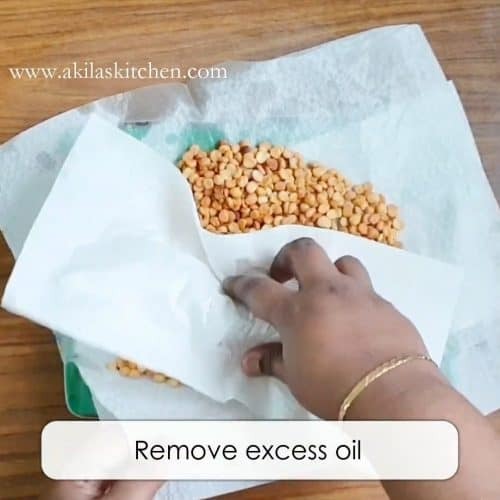 Remove the excess oil completely using a kitchen tissue and rubbing the fried dal. 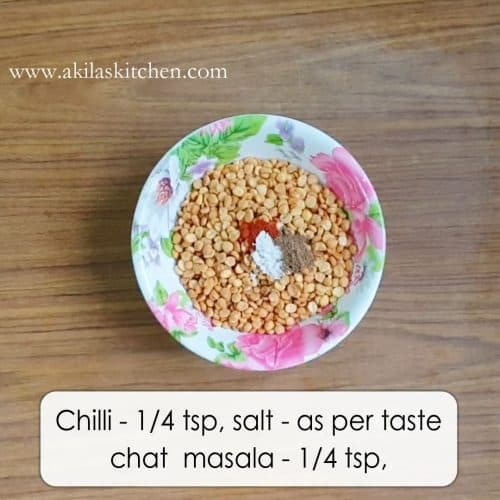 Now transfer them in a bowl, and add the chilli powder, chat masala and required salt. These things can be adjusted as per your taste. Mix them fully and store in a air tight container. 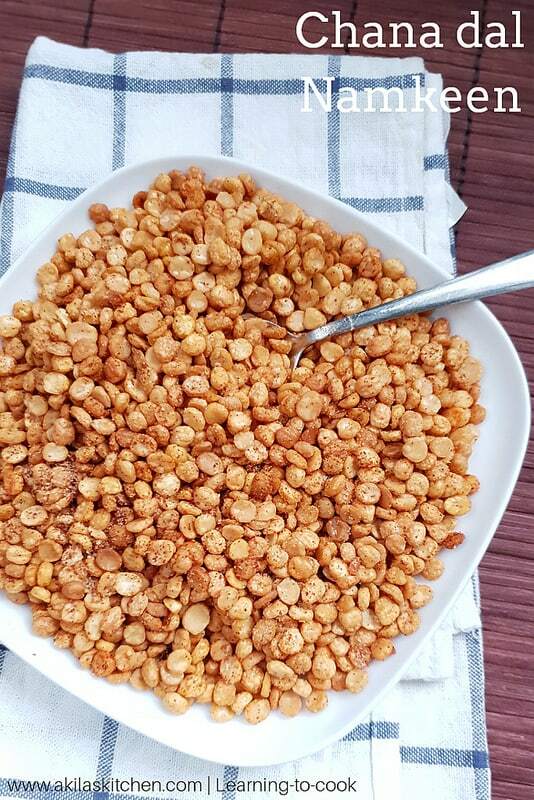 Yummy chana dal namkeen is ready for the evening snack. Wash and Filter out the water. 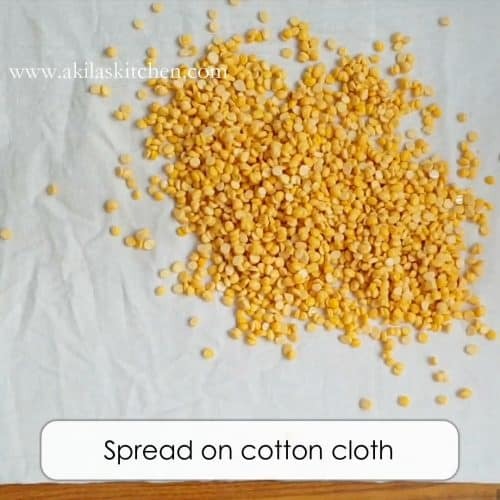 dry out completely in a white cloth by spreading them for atleast 2 to 3 hrs. Do not keep under sun. But can be kept under shadow. to fry the chana dal, add enough oil for frying. 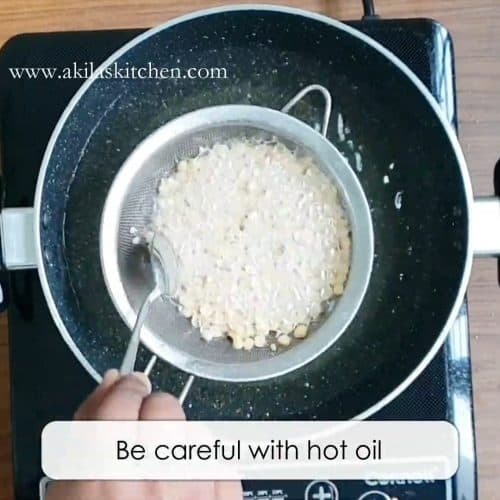 Add a single dal and check whether oil is hot enough for frying. 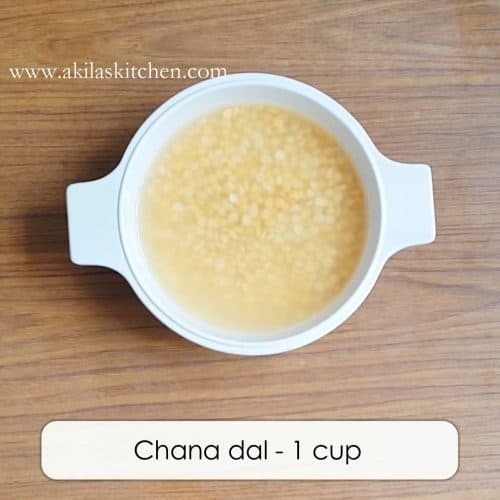 Once the dal starts floating immediately, then you can add in the other dal too. 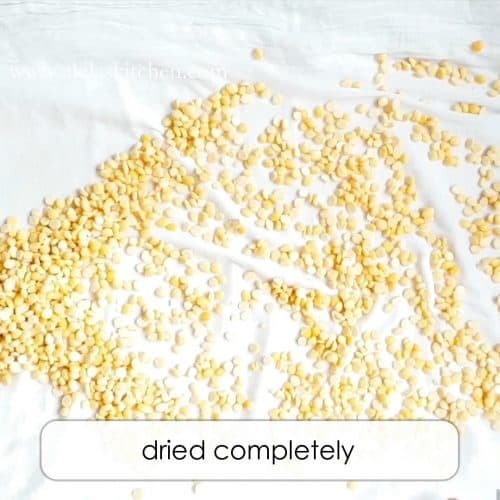 Instead of adding the dal directly to the hot oil, take a handful of dal and fry using a filter as shown below. If all the dal are added, some get burnt and some may be undercooked and you wont get the perfect crispiness of all the dals. 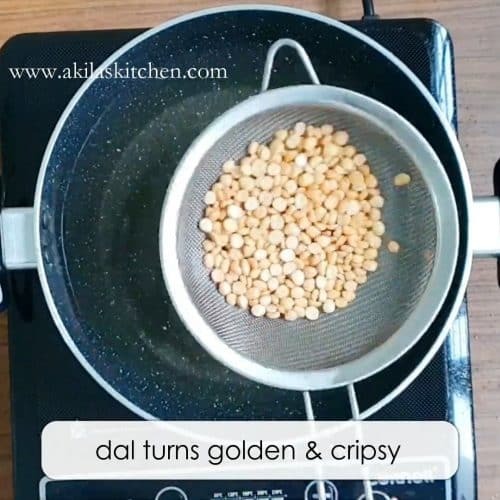 So frying the dal, using a filter gives an even frying and gives a perfect crispiness to all the dal. Also fry them in medium flame only. Be careful while frying the dal.